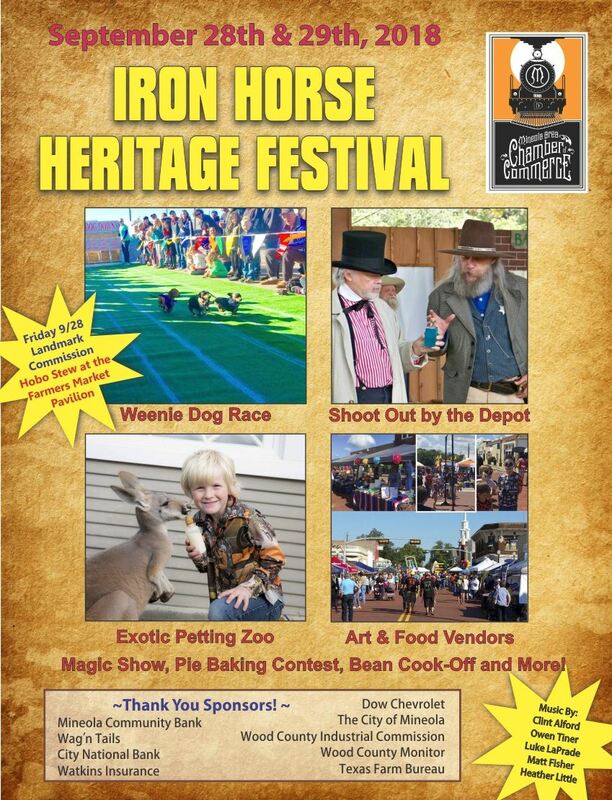 The Iron Horse Festival will take place on Friday, September 28th and Saturday, September 29th. Friday will be the HoboStew September 28 brought to you by the Mineola Landmark Commission.It will begin at 5 p.m. and continue until the hobos eat all of the stew.You’ll be able to preorder or just walk up and purchase your meal of stew,cornbread or crackers, dessert and a drink for $10. This will be held at theFarmers Market pavilion west of the Depot. Contact Doris Newman at 903-705-3399or to preorder. Proceeds will go the Iron Horse Square. Saturday will be a day full of fun and family with weenie dog races, pie baking contest, watermelon eating contest, food vendors, music, an exotic petting zoo, a bean cook off, bounce houses, arts & craft vendors, a shoot out by the depot, and much more! We have so many fun activities scheduled for this event so come and get involved! We can't wait until September!